This article was originally published Mar. 7, 2017, on CBC Music. Growing up in the ’80s in Scarborough, just outside Toronto, aspiring singer-songwriter Deborah Cox didn’t hear many Black artists being played on Canadian radio. But there was one: Whitney Houston. In 1995, Cox broke out from her role as a backup singer (including six months with Céline Dion) to claim the spotlight for herself. Clive Davis signed Cox to Arista Records and she released her self-titled debut. Immediately Cox found herself being compared to her idol in media and in the music industry, an assertion that was amplified when “Nobody’s Supposed to Be Here,” the first single from her sophomore album, One Wish, climbed to the top of the charts and stayed there. Houston herself even invited Cox to sing with her on the song “Same Script, Different Cast” for her album Whitney: The Greatest Hits. In 2015, just three years after Houston’s tragic death at the age of 48 and 20 years after those first comparisons were made, Cox was asked to provide the vocals for Angela Bassett’s Houston biopic, Whitney. 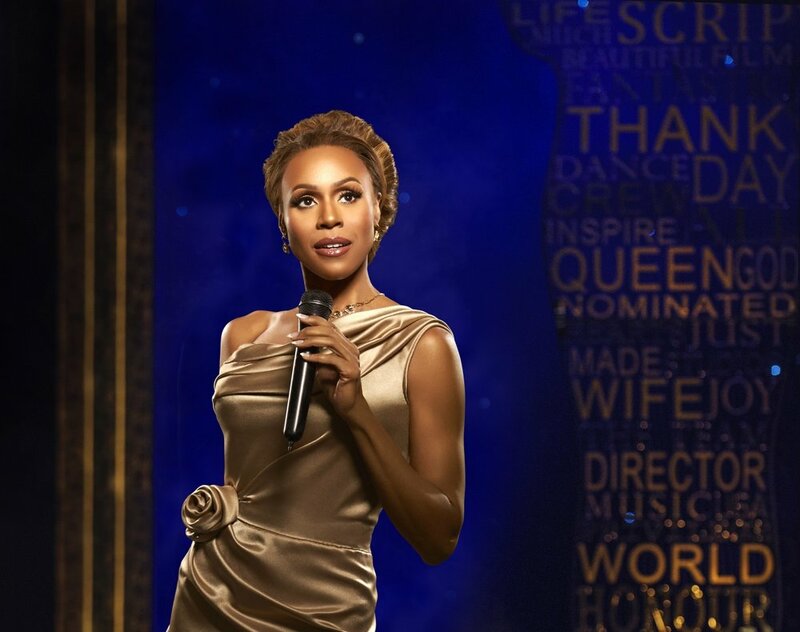 In 2016, Cox finally accepted an offer 10 years in the making to star in the U.S. touring production of The Bodyguard, a stage musical inspired by Houston’s 1992 blockbuster film with Kevin Costner (there’s also a Canadian production running through April 9 in Toronto). Cox spoke with CBC Music from the road in Columbus, Ohio, to talk about finding her voice, the 25th anniversary of The Bodyguard, and how a heart-to-heart with Houston changed her life. Do you remember the very first time you heard Whitney Houston's music as a child? "She sang 'You Give Good Love' and that just stopped me in my tracks. I had to know who that was singing. The soul that she had and the clarity, and the range — all of that in one was just not like anything I'd heard before. There weren't any Black artists really being played on Canadian radio at the time. We’re talking about the late '80s and it was just like, ‘Who is that?’"
You must have been so young! It must have been an overwhelming feeling. "At the time I was singing a lot in my room, just fantasizing about being an entertainer. It made a huge impact on me because her voice was just so pure and soulful and it was not like anything that I had heard on the radio. I mean, I heard Aretha Franklin, I heard Gladys Knight, I heard all these artists that were played on my mother’s stereo, but, there was nobody that sounded like Whitney. She sounded like she could sing any style of music, and there was a soul that came out whether she was singing jazz, pop, even dance music. It was just the versatility that she had in her voice, and that she brought that strong gospel sound to every song that she sang." It's so exciting when a voice is so modern but you can hear all of these different things that go so far back beyond a place you can even imagine, really. "Exactly. Like, ‘How Will I Know.’ I was just living when I heard that song. Because the background vocals sounded like her choir, you know? And her lead vocal just had, again, just clarity and the amazing range in an up-tempo song. That in itself was just something that was really very different." The Bodyguard turns 25 this year, it came out in 1992. "Wow! It's hard to believe, you know?" Do you remember if you saw it in the theatre? Was it a must-see movie for you? "Oh, yeah. It was a must-see for me. It was right around that time I was actually on tour with Céline, and so, ‘I'm Every Woman’ — that was the second release [from The Bodyguard soundtrack] — when we would do soundchecks we'd all sing ‘I'm Every Woman’ as well. And I remember how that soundtrack was the soundtrack for that tour. "I was beginning my career, I was in search of my own recording deal. I was out on tour. I have so many great memories when I think of The Bodyguard, the film, and it was right around that time that I was exploring my own career path. I just loved ‘Run to You.’ It inspired a song I wrote on my own album called ‘Where Do We Go from Here,’ which I don't think anybody really knew that." That's amazing! You can't see my face right now but I’ve got this smile that's kind of ridiculous. What about it moved you to that extent to write a song inspired by it? "It was the kind of ballad that was powerful, but it sounded really vulnerable as well. There's a strong vulnerability in there, and the way it was performed — I just loved that. Whitney just delivered every note; you could really just hear her spirit in that song, you know? It's produced so well." I was thinking about two songs in particular: "I Will Always Love You" and "I'm Every Woman" and the women that had originally recorded those songs were such powerhouses in their own right, and then to have Whitney Houston record them as part of this soundtrack — it's kind of a magical experience. "And at the time, I was between albums trying to figure out what my next move should be as well as switching labels, so that advice came at a very key moment for me. So now, fast forward to me in this show, in The Bodyguard, now it's like I completely understand and I've caught up to the advice that she'd given me. Which was all that glitters ain't gold, you know? I’m just happier as a person and as an artist and as a wife and as a mother because I was able to have the balance and be able to do all those things that I was kind of putting on the backburner for the business. You know?" Did you have reservations in your own heart about stepping into this role and occupying this space? "I had reservations in the beginning because I knew it was going to come with a ton of judgement. I’ve developed quite a thick skin being in this business anyway, and I know that there's a lot of haters and whatever, so I try not to be distracted by that. But that was why I was reserved about doing it in the beginning because I just wanted to make sure that it was gonna be executed right. That people would understand that my intention for getting involved is to always bring something positive, something inspiring, to bring something truthful and authentic to the role. I mean everything that I’ve done is always pretty well thought out. I don't just do things on a whim. That's just not my personality. I think through [things]. "This opportunity had been presented to me years ago, while I was doing Aida [on Broadway], and I never jumped at it because it was not something that I wanted to do at the time. I knew that they were still sort of developing it and everything and so, you know, they developed it in London and they did it and I was still across the pond, recording, putting out albums and remixes and touring and I still had a very busy recording career. That's kind of what stalled things, but then last year when the producers asked me about touring with this show and bringing it to a whole new audience, I read the script and I was really intrigued by it, and I thought it could be something that I could really get into. There's always judgment when it comes to tackling such an iconic person, you know? But I know myself that I have the discipline to take it serious enough to give it the integrity that it needs." I know that you did the biopic Whitney, and I just can't think of anybody else who could do it justice the way you could. "Right. Thank you. I pride myself in that, I mean, years of comparisons have brought me to this place, so I absolutely pride myself in that. We all know that there's only one, but it does take a special understanding of knowing her tone, timbre, phrasing, like there's a lot that she just did technically as a singer that is just all the right things. I know it intimately, and that's why we have a very similar approach." Establishing yourself as a Black artist in Canada, you certainly didn’t get as much support as I believe you deserved, so what do hashtags like #BlackGirlMagic mean to you at this point? "Oh wow. It's so special. It's great that we have social media now that can coin phrases and we have hashtags that we can keep the conversation going and I love it. I'm all about sisterhood and supporting each other, because I think that was what was sort of lacking in the forefront when I was coming up. There's room for all of us. We all are unique in our own way. It sounds cliché, but it's the truth! We have to do more celebrating and we'll start to see more come out of that, more creativity come out of it, and more stories being told. It's just so much better when you have a support system, you know, rather than being on your own. You're better when you have a team."